A big budget movie about the founding of Hong Kong based on the best selling novel by James Clavell. I do resist discussing the political point of view - it's long time ago, more or less true history and can't be changed anyway. Read the novel if interested, people say it was great. This is only providing shots of the ship and talking about the impact on the ships look. The story is about two trader's families (in fact opium dealers), and their war to rule the China trade. It takes at least two ships for such a film and so they originally hired two, the other one was the Golden Plover I think. But later they cut the budget and decided one ship had to be enough. So the Eye had to play a double role. Now what they did, was changing the look as much as possible. Apart from some settings on deck, they had to do something about the most obvious part of a sailing vessel - the sails. 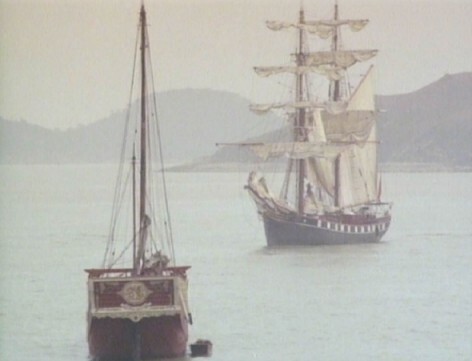 But as they cannot transform a brigantine to a fulrigger (I suppose originally the ships were tea clippers - tell me, if you have better information!) the decision was to change the color of the sails: White sails for the good guy, tan sails for the bad guy. So this picture here shows the Eye in her role as 'Morning Cloud'. When the first part was done, the filming company wanted to pay for a set of very cheap tan sails to use for the filming of the ship as 'White Witch'. But changing all sails is a lot of work to do and Tiger did not want to change again after the film work was done. So they agreed to share the costs for a set of solid sails with Tiger paying the balance. So after the film the Eye went off still wearing a kind of film make-up and never putting it down again. The shots on the following pages are done from the DVD by e-m-s available in a German/English version at Amazon. picture © De Laurentiis Entertainment Group Inc.